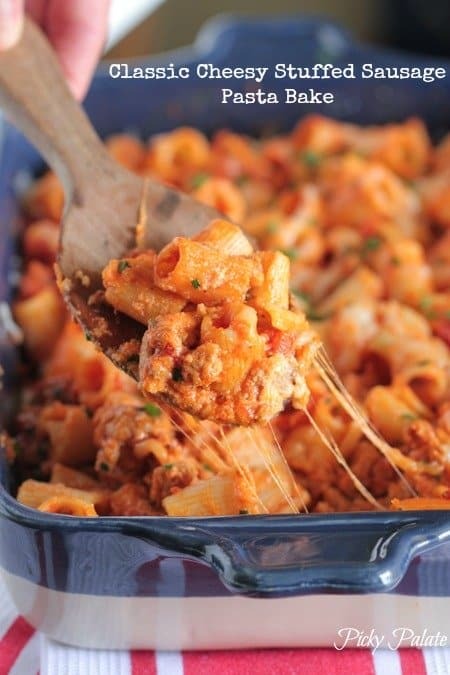 My Classic Cheesy Stuffed Sausage Pasta Bake makes the perfect weeknight dinner! I am all about the easy weeknight dinners these days. With school, sports and other activities each week it’s nice to have quick and simple classics to count on. This is just that. 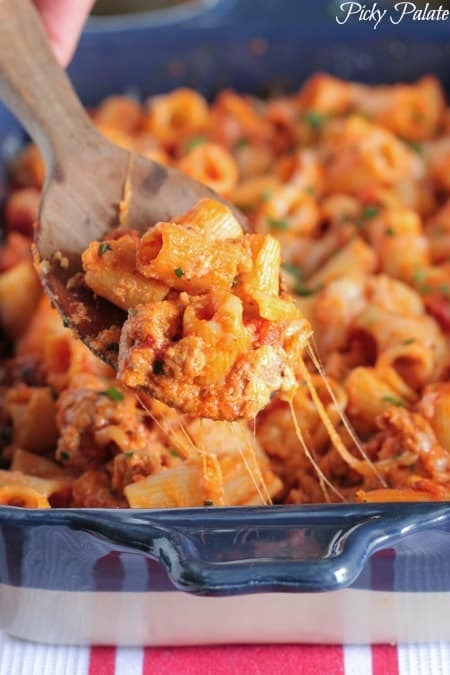 The whole family loves this Classic Cheesy Stuffed Sausage Pasta Bake and it’s a breeze to put together. Let’s see how easy it is to put together! Brown your Italian Sausage and add in your favorite pasta sauce. 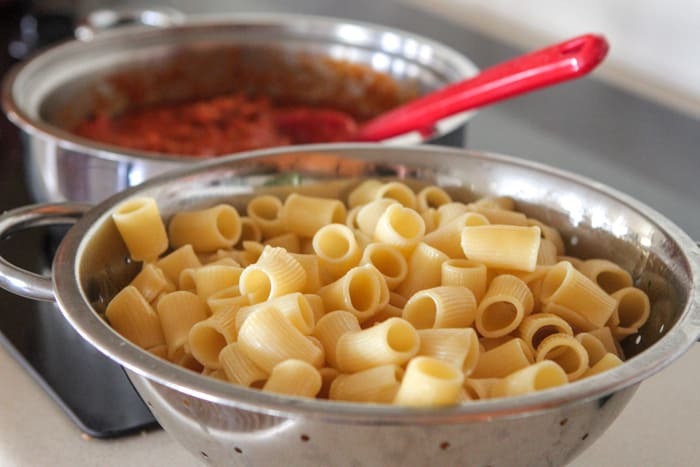 Cook your favorite pasta, one minute less than directed on package so they stay al dente when baked. Add them to your sauce and give a nice stir. Mix your Ricotta, Pamesan and Mozzarella then place dollops over half of your pasta in a 9×13 inch baking dish. Top with remaining pasta then sprinkle with additional mozzarella cheese. Bake until hot and cheese is melted. Come out cheesy and delicious! Preheat oven to 350 degrees F. and cook pasta according to package directions. Remove 1 minute before suggested cook time. Drain and set aside. Cook Italian sausage in a large skillet over medium heat. 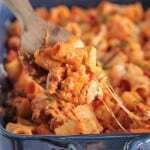 Stir in pasta sauce and cooked pasta. Transfer half of mixed pasta to a 9x13 inch baking dish. 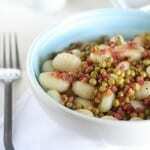 Place Ricotta, mozzarella and Parmesan cheeses into a mixing bowl and stir to combine. 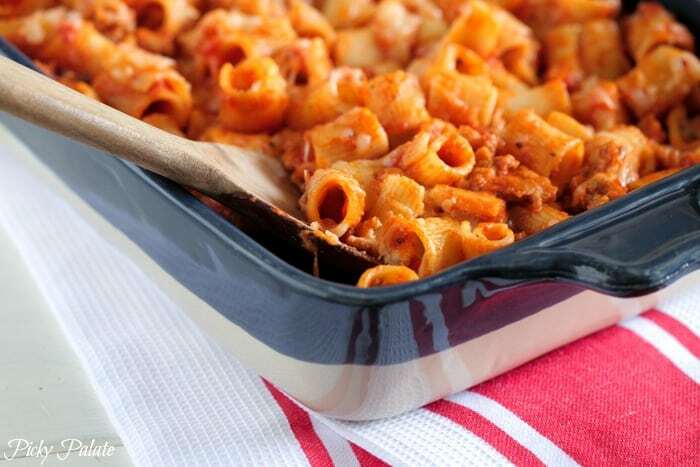 Spoon dollops evenly over pasta in baking dish. Spread to cover pasta. Top with remaining pasta then top with additional shredded cheese. Bake for 30 minutes, until cheese is melted. Remove and serve warm. I agree Crystal! Gets tricky during the week to feed everyone, lol! 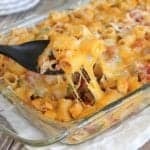 Easy dinners with cheese and sausage and carbs? How did you know EXACTLY what I was craving today? Pinned! Can’t go wrong with a traditional Italian dish. Love the sausage with pasta combo. Definitely my fav! Beautiful photos! This seriously looks SO good! My family would go nuts for it. Jenny, lovin’ the all that cheese girl! I have been craving a good pasta for a while and this is exactly what I would like to eat 😀 Those noodles too are perfect because they tend to hold all the good stuff in the center! YUM! Thanks for sharing! Great weeknight meal! we are always up for pasta! This seriously looks like the PERFECT!! family dinner. I love how cheesy it is! I know what’s for dinner tonight! This looks amazing!! 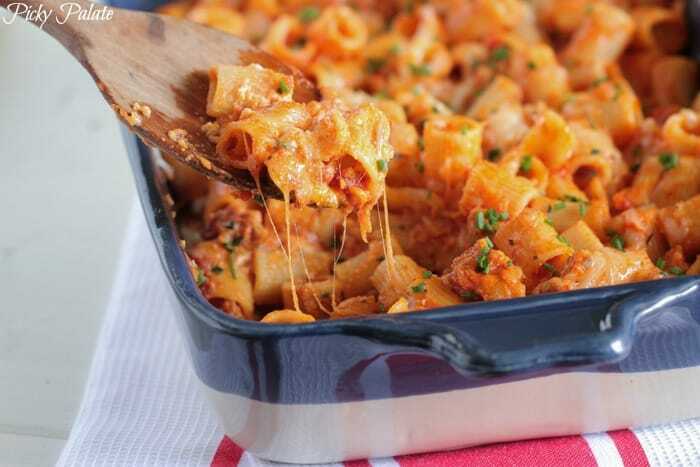 This looks so cheesy and good for a weeknight meal! How much ricotta cheese? Mozarella cheese is listed twice in the recipe and ricotta is left off. Did you add parsley to it before baking as well? It looks like it in the photos but it’s not listed in the ingredients. 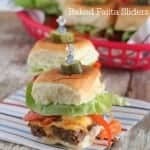 I love your weeknight meals! Love this. Great for a weeknight meal. Jenny, I made this for dinner tonight. It was FABULOUS!!! So glad you enjoyed it Susan! Thanks for sharing! Making this tonight for dinner. I LOVE pasta with sausage and all that cheese you can’t go wrong. I’m sure my family will love it. Thanks! I’m trying to get a hold of myself – that ooey gooey cheese is sending me over the edge! I so want some of this pasta! This was soooo good. I made this last night for my family. I loved that it made a lot so that we could have left overs. I don’t like ricotta cheese so I omitted that and added more mozz and parm. I was really tasty and quick to fix. Thanks again for all of your great recipes. Yum! Looking at these pictures makes me hungry! I love that you used ricotta in this recipe. 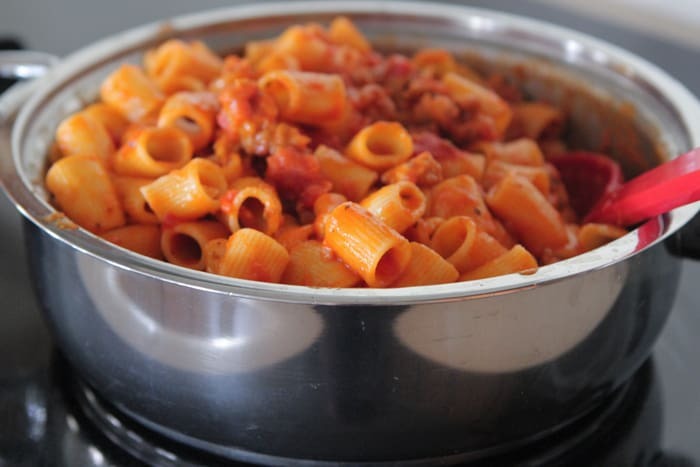 My daughter will LOVE this dish, she can eat pasta every day. Will be fabulous with cheesy garlic bread. Yes, Garlic bread for sure!! Which pasta sauce do you like? I’m still trying to determine my favorite!! When do you add the parsley? 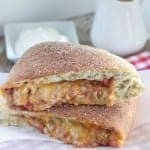 Can I use sour cream or cream cheese instead of ricotta? I don’t think that would work Bri. I would recommend leaving out the ricotta before substituting. You know I’m completely falling apart over this. FALLING.APART. That looks so yummy. Filing for future use! Do you think this would freeze well pre-baking? Did you cover this with foil when you baked it, or just as is? this was so good!! another well received recipe from my picky eater! she even went back for seconds! I didn’t have italian sausage on hand, so I used up some leftover grilled brats. just chopped them up until it was more like crumbles. It really worked well actually!!! my oldest won’t eat a brat off the grill- but like I said she devoured this!! and so simple. I put it together while they had some down time, and it baked while we did homework. WIN!! !